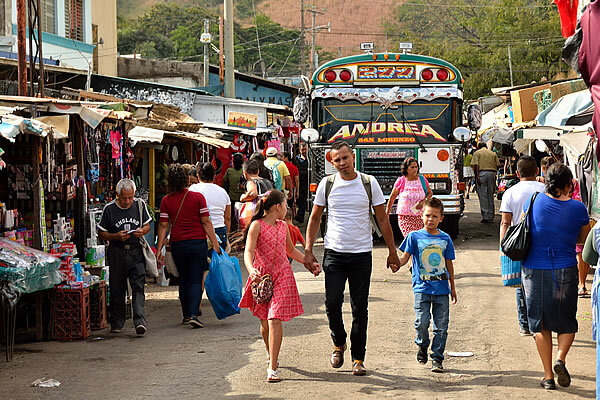 Santa Ana is a colourful town with a few old colonial buildings and beautiful squares. On a square, bordering a street with many brothels, an extreme amount of fireworks is sold from ramshackle little street stalls. You don’t want to know what is left of this square if a spark hits the wrong place. 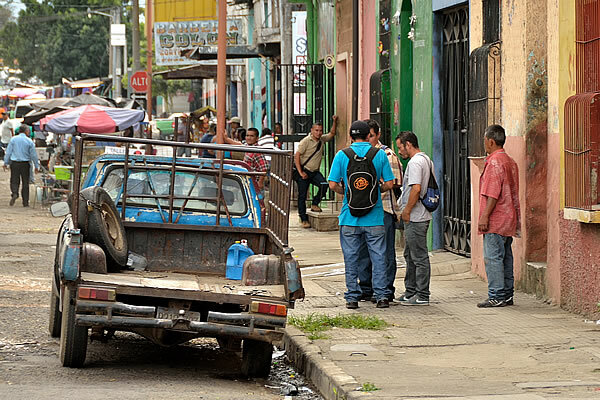 If you walk through the street with the Cervecerias (literally: beer cafes), which here serve also as brothels, then you see very clearly that prostitution here is still a low-end business. Women, who could have been behind one of the market stalls to sell bananas or vegetables, have their bodies on offer here. These women in tight clothes are mostly very ordinary; old and young, fat and thin. We also see men hanging around and negotiating the price with the ladies. This is not the type of red-light district that you see in other places in the world, like Bangkok or Amsterdam. There is no pride and haughtiness here, and the places look dreadful. These ladies have to feed their children and this is a way to earn money. It is just as simple as that. And since the customers do not look wealthy here, little money is paid for the service they offer. 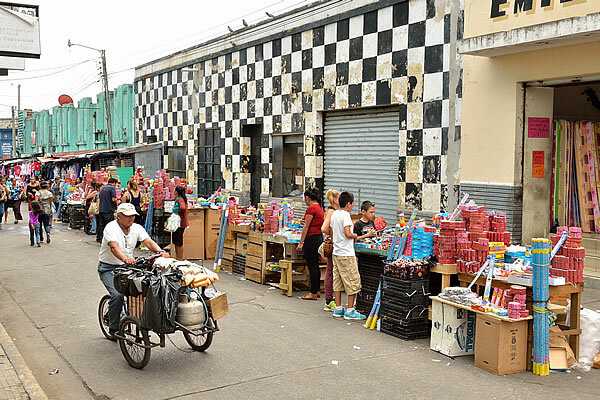 Santa Ana is one of the last colonial towns of El Salvador. The narrow streets that used to be the domain of pedestrians and horse-drawn carriages, are now being terrorized by smoke-spitting buses that race from one crossing to the other. It looks like if the drivers are more satisfied by driving the buses as fast as possible, than with the collection of the 'dimes' and 'quarters' that passengers pay for a bus ride. 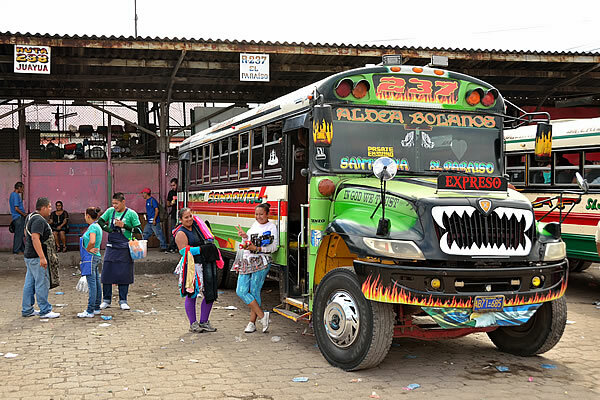 The old American school and city buses produce such a quantity of black smoke that lung cancer is undoubtedly the number one cause of death for people who have to earn their living on the streets of Santa Ana. Where possible, we also take such a smoke-spitting dragon to minimize our time in the fuel-infested streets. Santa Ana attracts a dozen of backpackers who come here every day to climb the Santa Ana volcano. The volcano is only 20 kilometres from the town centre, as the crow flies, and can easily be seen from the roof of our hotel. 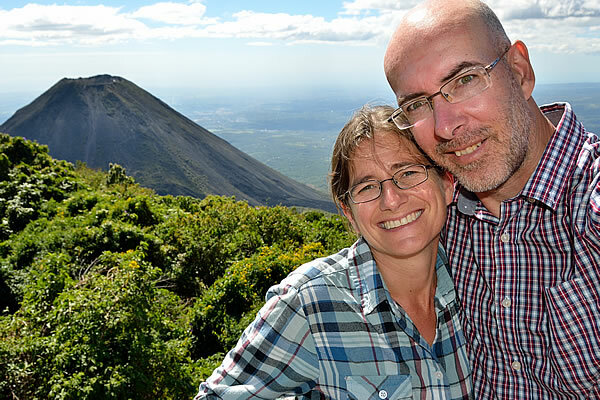 A local bus runs every morning in a little more than one and a half hours to the visitor centre of the national park "Parque National Los Volcanes", in which the Santa Ana volcano is located, together with two other volcanoes. The visitor centre isn’t much more than a cash desk for buying the entry tickets, a dusty parking lot and a number of stalls where a meal or drink can be enjoyed. From this parking lot, only once daily at 11.00, a guided hike leaves for the craters of the Santa Ana or Izalco Volcano. Individual hikes to the volcanoes are not allowed for safety reasons. Not because the authorities are afraid that one of the volcanoes starts coughing or provoking, but because they are afraid that walkers might get robbed on the trail. This path could be a lucrative business for the local bad boys. 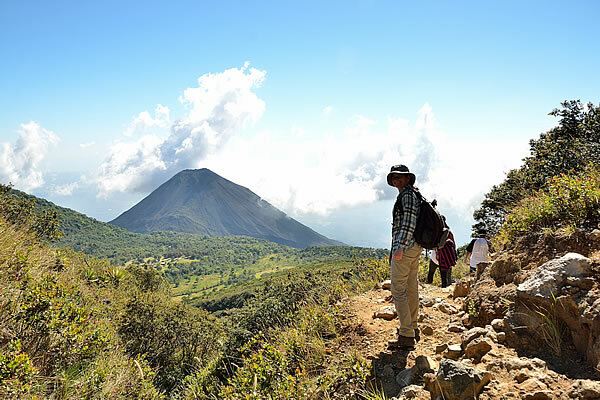 After all, dozens of richer El Salvadorians and foreign travellers hike up the volcanoes every day. The group therefore consists not only of hikers and a few guides, but also of two armed members of the tourist police. Before the group leaves, we first get an explanation in Spanish from one of the guides. Our Spanish is not very good, but we understand that the walk takes about four hours (2 hours up and 2 hours down), that we will conquer 650 altitude meters (both up and down) and that we are asked not to leave garbage in the park. For us this sounds like an open door, but for El Salvadorians that’s apparently not the case. One of the El Salvadorian fellow hikers is of the opinion that the park staff should clean up the mess, in exchange for the admission price that he just has paid for entering the national park. So in his opinion the entrance fee does not only gives him the right to visit and experience this beautiful nature area, but also to pollute it! Our group consists of about fifty hikers, including eight foreign travellers. During the first 20 minutes we walk up the volcano in single file. The local people in front of course, because just like the bus drivers of the country, this hike is seen by them as a race. Apparently we are not fast enough, so regularly we step aside to let a group of cackling and chips-eating locals pass by. Ivonne comments: "I would not be able to climb the volcano and enjoy a bottle of cola and a bag of crisps at the same time". But less than fifteen minutes later it appears that most El Salvadorans cannot do either. The fat of the chips and the sugars of the cola are apparently already burned, and regularly we see walkers panting against a tree along the path. Also the children who previously passed us on all sides as bouncing balls, now support their upper legs with their hands, to use also their arm strength for the climb upwards. We started patiently and climbed upwards at cruising speed. After six kilometres, and a short two hours walk, we arrive reasonably fit on the crater rim. We don’t need time to recover, so we can immediately enjoy the fabulous views. 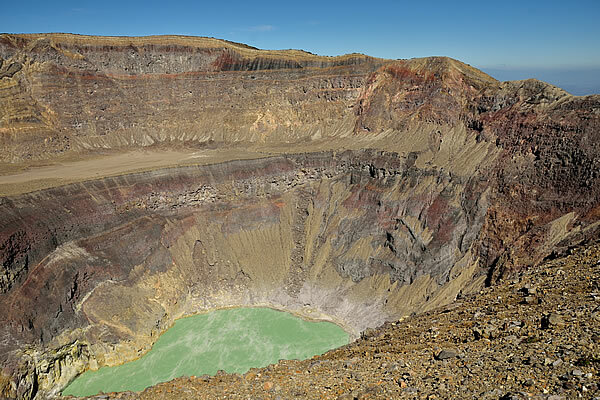 When we look into the crater we see a poisonous looking green sulphur lake deep below us. White smoke plumes float just above the water surface. Some hikers are blinded by the beauty of the place and start taking risks. They move closer and closer to the pebbly edge of the crater to make the best possible picture. The guards regularly use their whistle to warn people, preventing them from taking irresponsible risks in the hunt for the perfect selfie. We are 2200 meters above sea level and if we look to the southwest we have a beautiful view on the dramatic black Izalco volcano. The Izalco volcano is 1910 meters high and is the youngest of the bunch. It was not until 1770 that the volcano was formed and it still spits smoke and boulders on a regular basis. Looking west, we have a formidable view of Lago de Coatepeque, which is more than 1400 meters below us (Lake Coatepeque), which is also a volcanic lake and originated more than 50,000 years ago. When we look south, we see the Pacific Ocean, which is only 30 kilometres away. The views are magnificent and the tough hike to reach this point was absolutely worth it. After half an hour, the whistle sounds again and one of the guards asks us to start with the descent. We take a last good look around, grab our backpacks, and start the descent. We meet a few people who are still busy with the climb up, and who have almost reached the crater. The guides and guards give them a few minutes to recover and enjoy the view, where after they also have to descend. Even on the way down we regularly make space for local walkers who also experience the hike down as a race. As a result, there is a lot of dust development on the trail so we regularly slow down a bit to allow the dust to disappear. The fact that you have to walk up and down in a group can be experienced as the only drawback of this beautiful walk. How much better would the experience be if you could make the ascent at your own pace and without the crowds? And we are still lucky, because in the high season the group size can easily increase to as many as 250 hikers! Yet, we are still very satisfied and arrive after one and a half hours descending, with a smile on our dusty face in the parking lot of the visitor centre. We buy another cup of coffee and wait patiently for the 16:00 bus that will bring us back to fuel infested streets of Santa Ana.